Our focus has been using all of our white and light fawn fleece as, naturally, these are the finest fleece available and make up both the majority of the New Zealand and our alpaca herd. 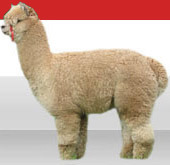 We believe the New Zealand annual clip of these luxury end of the alpaca fleece types is about 40-45 tonnes. In 2014 we processed 4.5 tonnes so their is plenty of potential out there! Alpaca Duvets and Pillows: Duvest are 100% alpaca-fill in a luxury, sateen cotton cover prepared in partnership with Ellis Fibre Limited (makers of Novadown) - Luxury Alpaca Pillows are blended with lambswool. Select this link. 100% Alpaca Throws in Natural Colours. 100% alpaca throws in brushed and boucle designs. Gorgeously soft and warm! Select this Link. Undyed Alpaca Yarns: Our collection of natural coloured yarns - marls, boucle, 4-ply, lace-weight (2-ply), sock weight (4-ply), aran 10-ply and DK 8-Ply. Select this link. Multi-Dyed Yarns: Our collection of dyed yarns (variegated colourways) including those selected by yarn guru Doe Arnot ... simply wonderful! Select this link. For details of other products please follow this contact link.